With his dark crime comedy God Bless America, comedian-turned-filmmaker Bobcat Goldthwait is up to his old politically incorrect tricks again following World’s Greatest Dad (concerning a father trying to cash in on his son’s death) and Sleeping Dogs Lie (about a woman confessing a disturbing secret to her husband-to-be). 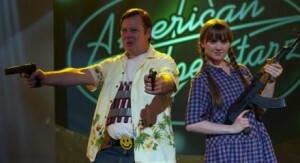 Joel Murray and Tara Lynne Barr go for their guns on a reality TV show in God Bless America. Those who agree politically with Goldthwait’s angrily liberal politics will appreciate God Bless America more than viewers on the opposite side of the fence. But despite the filmmaker’s best intentions—to take a broad satirical swipe at things he believes are bringing down the country—his targets are sometimes too obvious, the film goes on too long and he brings little style to the proceedings. Thankfully, Goldthwaite gets nice performances from Murray (younger brother of Bill) and young Tara Lynne Barr, who inject pathos, sensitivity and (non-sexual) chemistry into their roles.